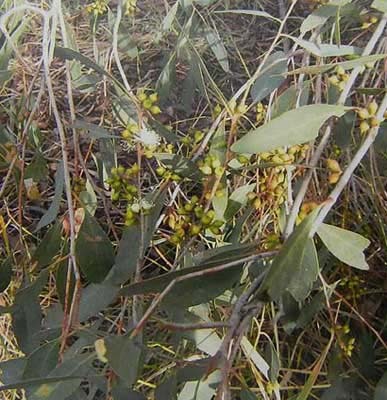 Eucalyptus Cadens (Warby Range Swamp Gum) is an interesting and an uncommon plant. Whilst it is rare in this area, it can be found in small numbers in South western NSW and near Beechworth. The Warby Range sites have specific conditions for survival; damp areas near water courses and springs. Eucalyptus Cadens can reach a height of approximately 24 metres and is a long-lived tree. It is characterised by its leaning habit. The bark is smooth on the upper trunk but the lower trunk is rough and woody. Flowers are white and the fruit is up to 5mm long. Conservation is important for the ongoing survival of the Eucalyptus Cadens. Threats include weed invasion, grazing, clearing and fire.